Waialae School benefited significantly from the consultation work of Tadia Rice. As a highly skilled professional of the highest integrity, she provided expert executive level coaching, as well as effective leadership, during a time of critical transition for our educational institution. Tadia’s work facilitated beneficial systems-level change for our employees, and deep personal growth for our administrative staff. I particularly appreciated her expertise, professionalism, and ability to clearly communicate with all levels of our organization. Due to her comprehensive consultation and extensive background working with diverse industries, Tadia provided Waialae School with the ability to create new systems, protocols, and efficient policies that will guide our work for years to come. I highly recommend Tadia Rice to any organization seeking to improve and transform their operations. Nuflow recently recruited Tadia Rice as keynote speaker for our Annual Licensee Conference. We received only positive feedback from the delegates – they appreciated Tadia’s hands-on approach, extensive business knowledge and ability to relate to a diverse range of sectors. Tadia had a real impact on them and they have taken away some great knowledge which they can apply to growing their business. Tadia has a wealth of knowledge and experience, she will not just educate you, she will take you on a journey. Tadia, it was a pleasure working with you! Tadia Rice of Rice Consulting understands business, and she understands the leader’s journey in creating a successful business. She asks the right questions, provides valuable insights and recommends constructive courses of action appropriate to a leadership role. Tadia prepares every executive coaching session with written material, interactive exercises and items for discussion. Most importantly, she holds her clients accountable for making necessary changes – in themselves and their organizations. Tadia is an effective executive coach who offers pleasant and engaging sessions that makes the journey enjoyable. 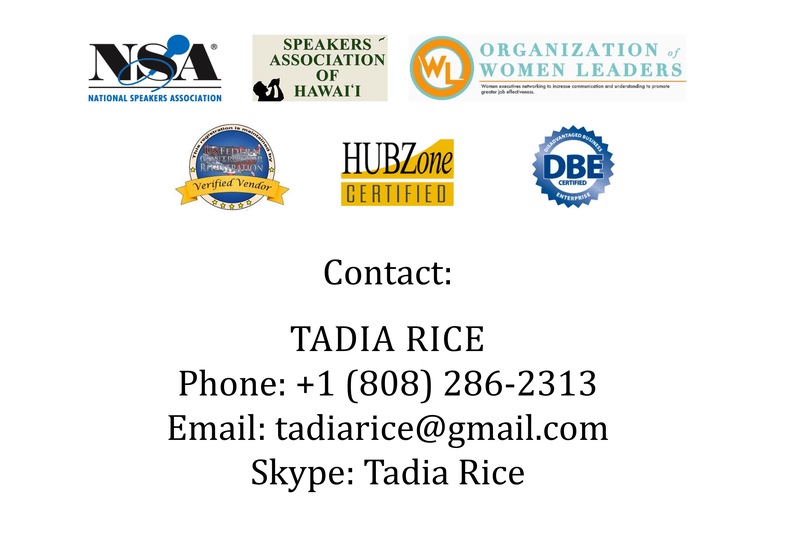 I highly recommend Tadia for business executives who want to become more effective leaders and team-builders..
As Director of Development at Easter Seals Hawaii, and a seasoned people manager, I am familiar with the potential and pitfalls of professional training. Therefore, I approached executive coaching with circumspect and caution. After registering for Tadia Rice’s Empowerment Program for Women Leaders I quickly realized that this she was not an ordinary coach, nor was this program! She deftly moved me beyond the surface of my professional goals, and together we delved into issues of leadership, communication, personality, and motivation that I had not explored before. She put me at ease while challenging my “well earned” assumptions. She helped me recognize that some of my patterns were not supporting my goals, and this motivated me to make needed changes that have benefited me immensely. I especially appreciated Tadia’s global perspectives and cross-cultural savvy. I have learned to be my authentic self, as well as to trust my audience. That helps me communicate my knowledge more effectively to those less experienced. My emotional intelligence has improved, and Tadia helped me understand how delivery gets in the way of content. I will always be grateful to her for introducing me to my own enduring and limitless potential. As a professional board member of a non-profit, it was a great investment in getting the right mentor for the job. Tadia Rice has illustrated that it does not take a professor to determine the type a leadership you can illustrate, but the type of leader you can be in the future. Her teachings and her ‘outside the box’ thinking has shown that her lectures are fun and entertaining and with the personal experiences that she integrates makes it more personal and more of a journey rather than a path to nowhere. She can lay a foundation for any subject and can give you the tools to help build that future to a reality. I needed to focus my career and develop the process to maximize my talent and attain higher goals. Tadia Rice helped me refine my presentation skills to insure stronger impact and greater effect when speaking to large audiences. She helped me streamline a realistic plan to achieve a more viable and profitable operation. Tadia helped me explore my hidden creativity so I could unleash more imagination and build confidence. She empowered me professionally and personally. Tadia Rice possesses a remarkable adaptive management style, EI clarity, business acumen, leadership capacity, and organizational skills that are exceptional. Her expertise is a combination of intelligence and integrity, complimented by cultural acuity that is profound. She effectively communicates regardless of language, politic, or ethnicity. Tadia understands protocol. Her diplomatic skills in international circles are reflected in the successful global relationships she has established. Tadia understands entertainment and media, and is one of the best negotiators there is. She has served as my co-writer on numerous occasions, as well as advisor on many creative productions. Tadia’s devotion to human rights and humanitarian work has been demonstrated throughout her life. She has served on my Board of Directors of the Princess of Africa Foundation, is my confidant and the most wonderful person I have met. This is why I made her my business partner! I would like to thank you, and compliment you, for the corporate training course you so capably molded to fit the needs of my staff and myself. The nature of our business is different to other selling techniques, and your presentation to our small but diverse and fairly new team was well accepted. It was imperative that the team members received individual attention, and you delivered! Tadia, your positive nature and international corporate experience were refreshing and appreciated by all! Tadia Rice offers a “take no prisoners” approach to her practice. She has helped me reach both creative and practical goals that improved my film script when it was in pre-production. Tadia’s insight, intelligence, experience, and wisdom are reflected in her thorough consultations. She is fully involved when listening, and her laser-like focus results in sound advice and constructive guidance. Tadia understands the practical requirements of creative projects, and what it takes to bring ideas to reality. Her suggestions were accurate and valuable. She provided the timely feedback I needed to improve my project. The results were proven with a more effective story, stronger structure, and greater credibility. Tadia opened my eyes to greater possibilities for this project. My movie, The Encounter, was released in 2010 and has won numerous film Awards! Tadia has a huge heart. She is like a very rare diamond. She shines. Thank you so much. Your training on the Value of Personal Transformation; How to Motivate Others; and How to Advocate Change was fabulous. Indeed it was what every human services provider should know. Mahalo! Tadia Rice is the most insightful individual I’ve met. Her ability to identify obstacles that prevent personal transformation helped me unmask the disguise and decoration often preventing me from becoming my best self and achieving my goals. She taught me how to be my own best friend and get to the core of the problem, whether goal setting, team leading, communication, or procrastination. Tadia has the uncanny ability that promotes self-discovery, enabling me to absorb and understand the course of action needed to recognize what I needed to do instead of being told what to do. Tadia offers solutions that help make profound transformation in my business and personal life a reality.